I can hardly believe that you are five. It just seems like yesterday that we met you for the first time. Five years ago we couldn’t have guessed how things would be today when you made your emergency entrance into the world. This year has FLOWN by and what a year it has been! Four days after your fourth birthday, you welcomed your little sister into the family. Since day one you have been an incredible big brother. You are protective, loving, sympathetic (unless she takes your toys), empathetic, and quite the comedian when it comes to Lorelai. Sweet boy, you make her laugh and giggle like no other. She loves you more than she can express right now. I’m so thankful that we get to be a witness to such a strong bond between the two of you. You’ve been fairly healthy this year. A few colds, ear infections, and some breathing treatments, but overall, healthy. In May you had ear tubes put in because it was noted that you had some low tone hearing loss and some fluid build up. You were so brave, walking down the hall with the nurses and anesthesiologists that day. Dr. Friedman said that you had tons of fluid in your little ears, but she got those tubes in and your hearing has improved some and NO more fluid! We’ve continued to struggle to get you to gain weight, but you finally moved those numbers on the scale a tad… 28 pounds!! You moved from a PPCD classroom into a co-teach Pre-K classroom. You have bloomed! Not only is your speech getting better, but you are reading and comprehending what you read at a level well above your age. You even read to your class this year! It blows my mind that you can read this letter this year. Academically you are a rock star! You still have some delays with your motor skills, but you get an A+ for your effort! You are working hard at using scissors, writing with a pencil, coloring with crayons, and even tracing and writing letters! Your jumping is improving and I understand that you are starting to play with your classmates on the playground. You love school and every day you tell me what you did that day. It’s so much fun listening to you recall the daily activities and see the excitement from learning something new. You are SUPER social. As in, absolutely no boundaries when it comes to new people. You also have a tendency to say whatever is on your mind, so we are working on teaching you tact. One of my favorite stories happened recently. You were going to a doctor appointment with mama. We were on the elevator with many doctors, mostly female, and a few other people. You had on a shirt that said, “Hello Ladies”. One of the female doctors asked what your shirt said, and you told her in a drawn out voice, “Helloooo Ladies!” It was SO funny. The whole elevator was giggling. She responded with “Hello Handsome”, and you got SO offended and told her in no uncertain terms that your shirt didn’t say hello handsome, it said hello ladies! You count people coming and go from places, and have no qualms about sharing personal information or even asking them personal questions. Thankfully, most people are VERY receptive to you. After all, you did tell one lady, when asked, that everyone told you that you were cute! You love to help and pride yourself on being a great helper. You’ve started building things with Daddy and you love every minute of it. I’m sure Daddy loves every minute too, even if you do slam the hammer into his hands or try to build it your own way. You’ve always done things in your own time and own way, so it is no surprise that you still do that, even at five years old. You tell us frequently that you don’t need help and you can do it by yourself. You are 100% potty trained and it’s super funny to see you wear your underwear backwards or inside out and backwards. I giggle even more because you can’t stand your seam to be off by one tiny bit on your sock, but those underwear can be worn any which way. You finally kicked your paci habit. We’ve had to substitute some chewy tubes, gum, and well, most things you can chew on to keep you off the paci. You even try to sneak sisters! Sounds are still a huge trigger for you sensory wise. We have learned not to leave the house without headphones, just in case, and you do a great job of asking for them and even trying to tolerate the sound at times. You repeat EVERYTHING and you tend to do it more when you are overstimulated. It’s one of the signs that tells us you need a sensory break. You still like to snuggle and it warms my heart to have you throw your little arms around me, hug me, and snuggle up in my lap. You were over two months old before we were allowed to hold you for the first time, so these little moments are so special to us. You are an awesome little guy. I’m glad that I get to be your mommy. I love EVERYTHING about you… I can’t wait to see what the next year holds for you, sweet, silly boy. I love you all the way to the moon and back! 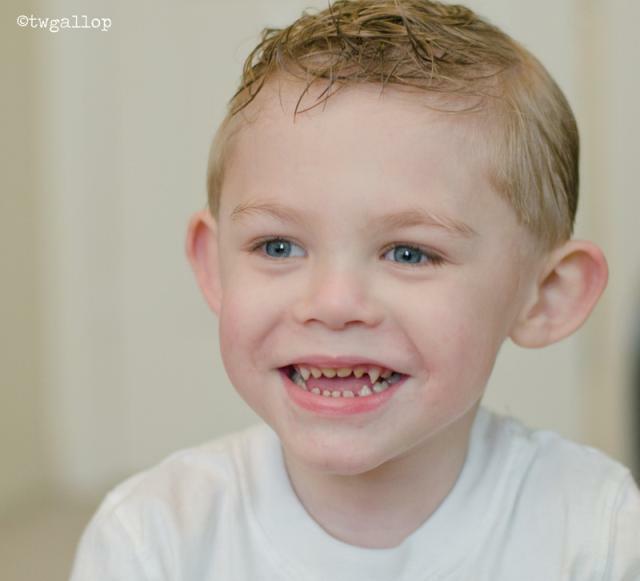 It took some time to get Cayden’s photos for his fourth birthday. His sister was born four days after his birthday and I was unable to be up chasing him with my camera for a few weeks. Once I could, I was quickly informed that “my not take pictures”. Okay. So, finally, after much talk about it, I got the request. “Mommy, take my pickure”! Yay! Absolutely, little guy. So, the first day, we went in and I took pictures of him playing with his blocks, which is something he does ALL the time. He loves to build. It was a few days after that I was able to get him playing with something else, his cars, puzzle, and again, his blocks. I didn’t catch him playing with his PlayMobil, his McDonald’s, or reading. (All favorite activities) Once the blocks come out, all else is forgotten for a while. I knew getting him to pose would be difficult at best, so I tried to capture him in his element, playing. He loves to play and can be so serious about how he conducts his play business, conversations and all. You’ll even see him chewing on a chew tube, which helps meet his oral sensory needs. Click the picture to see all of his photos! 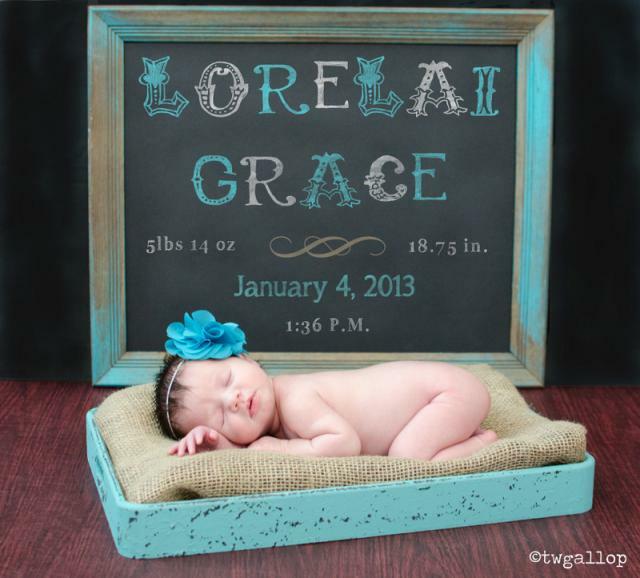 Lorelai Grace made her grand arrival on January 4, 2013. Despite pre-term labor and a high risk pregnancy, she managed to stay put until my scheduled c-section. Lorelai was born at 38 weeks, 2 days gestation. My c-section was scheduled for 1PM and we had to arrive at the hospital to check in two hours earlier. I wasn’t allowed to have anything to eat or drink after midnight and no heparin the morning of the procedure. I was a NERVOUS wreck. Cayden freaked out when his sitter arrived to stay with him and we had to leave. He clung to me and sobbed and it just broke my heart and I cried half way to the hospital. We arrived at the hospital and went up to labor and delivery to check in. My room was being cleaned, so we waited in the c-section waiting room with a stern warning to me not to eat or drink anything. It wasn’t long and they got us into our room. Our room was large and spacious, just a bit on the freezing side. I changed into my hospital gown and settled into the bed to start all the paperwork. I was hooked up to the heart rate monitor and asked a gazillion questions about my medications, medical history, any all about my first birth. An IV was started, I signed all the consents, and then registration came in and had us sign papers for insurance and billing. While we waited for the schedule time, 1PM, to arrive, we watched the game show network and tried to relax. My anxiety was VERY high, as I had time to think about this delivery versus the emergency situation with Cayden’s birth. Before long, it was time to get ready for the operating room. Nate took out our jackets and my clothes to my mom, who was in the waiting room, and then came back and gowned up. I had to put my hat on and we walked down to the OR. Nate had to wait in the c-section waiting room again until they were ready for him. I had to get up on the table and get positioned for my epidural. It was a far different feeling than the one I had with Cayden. It was a little painful and I kept feeling pain on my left side. Each time they added the medicine, I would feel a jolt of what felt like lightening surge through my body. It was VERY uncomfortable, but the epidural worked and we were set to go. I was introduced to all the people caring for me. The nurse anesthesiologist got me hooked up to all the monitors and I was further prepped for the actual surgery. My doctor arrived and checked all the charts and asked me questions about my meds and eating, discussed my meds for after surgery, and checked in on my emotional well being. We were both excited that we made it to TERM and were doing this in an non-emergency setting this time around. About that time, my nurse realized that my actual hospital bracelets weren’t on! She was SO embarrassed because she is such a stickler for that and missed it. She was razzed by the entire crew in the OR, including my doctor…lol!Dr. Leeds-Richter scrubbed in and we were ready to go. Nate came in, sat by my side and held my hand, checking in with me about my anxiety. I said that I was VERY anxious and the nurse anesthesiologist and my doctor both said that was absolutely normal. The nurse anesthesiologist aid that it will be different each time and that the next time would be different too. At the same time, Dr. L-R and myself were both like, uhm….I followed with “we’ll think long and hard about that one”, and she said, “we’ll talk about that”…lol! I love my doctor. She told Nate that she would let him know when to get his camera ready. I could feel the pressure as she cut and tugged and before long I heard her telling Nate to get his camera ready. At 13:36, Dr. L-R held up Lorelai and said, “Look at that big baby!” while my sweet girl screamed her little dark head off. She was gorgeous. Full term, head full of dark hair, great set of lungs. I got tears in my eyes. Nate went with her to her bedside to take pictures while they sewed me up. He came back when they brought her over to me. I was handed my daughter all swaddled up. It was very emotional and surreal. I couldn’t believe I was holding my little girl in my arms after such an eventful pregnancy. Then she was handed to her daddy and more pictures were taken. He had her sweet little foot prints on his gown and he was SO proud. She was 5lbs 14oz and 18.75 inches long! Soon after, I was wheeled to recovery and she was brought to us to attempt to breast feed. She did okay and then was taken to NICU for six hours for observation because of my diabetes during pregnancy. She did great in NICU with no blood sugar issues and was able to come to my room late that evening. Cayden was the first to meet her in person, just like we wanted. He wasn’t overly interested in his sister, but was glad to see his mama. Thankfully, we were able to get him to let us take his picture with his sister later on. We had a good hospital stay with minimal issues. Lorelai came home with us on Monday, the 7th. She had lost weight and was down to 5lbs 3.65 oz and was tiny compared to babies her gestational age, yet she was absolutely perfect in every way. Her newborn clothes were way too big, so she had to wear a preemie outfit home. Cayden was VERY jealous of her when we got home and demanded that I “give Worewai to Daddy RIGHT now!” repeatedly until he could crawl in my lap and love on me. We know he will come around as he overcomes all the changes and sensory stimulation that his little sister will bring into his world. Welcome to the family, sweet Lorelai Grace. Just wanted to add some pictures of Cayden’s celebration on his birthday! We keep it small, just family, since he celebrates with his party on his half birthday. He was a bit terrified to blow out the candles at first, even though he asked for them. He eventually blew out his candles and enjoyed the cake he picked out! New Year’s Eve is always an emotional day. It’s the day I met you, unexpectedly, for the very first time. Last night, before bed, we talked about your birthday. I explained how you weren’t moving much and mommy went to the hospital and you had to be born because you were very sick. I said that you were SO tiny and you informed me that you were small like Baby Luke. I told you that you were MUCH smaller than Baby Luke. I explained how the doctors, nurses, respiratory therapists, and hospital staff were so amazing because they helped you come home with us 124 days later. You said that the doctors helped you get better at the hospital. How right you are, baby. What you don’t know is how much you fought to get better too. How many people prayed for you, sent positive thoughts, and just were in awe at this little bitty baby struggling and fighting to overcome more than most people experience in a life time. Daddy and I believe that your fighting spirit and your strong will helped you to survive what was terrible odds. We still see that fighting spirit, just in a more toddler/preschool manner. 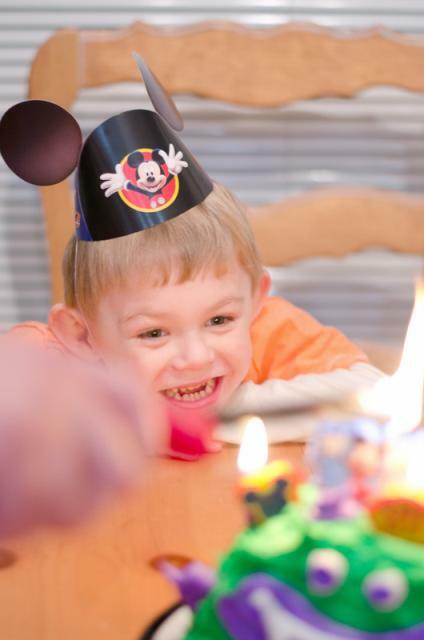 After you turned three last year, you started PPCD, or preschool program for children with disabilities. It was a little rocky at first and mommy had a hard time accepting that you were old enough to go to school! Soon, you LOVED school and getting on the school bus. You were thriving and working on your goals. There were bumps in the road, but as usual, you would find ways to overcome them or work with them. Before summer rolled around you weren’t talking much at all. You had maybe a handful of words and many were not what you were trying to say. I was your “bobby”, not mommy. Then just before school was out for the summer, you started saying a few more words. During the summer, you were working hard to repeat what we were saying. Then, just one day over the summer, you started really talking. It just came out of nowhere, just like Mrs. Donna said it probably would. To say we were ecstatic is an understatement! Your little voice was music to our ears. Over the summer, you got your SMO’s to help straighten your ankles when you walked so that you would, hopefully, eventually be able to run and jump and have some better balance. The difference in your little alignment was noticeable immediately. You also were told that you were going to be a BIG BROTHER to a little sister! Soon, summer was over and you headed back to school. You had a much more difficult time going back after summer than you did when you started school. We noticed that your sensory processing disorders were getting worse, not better with more communication and cognitive ability. Large crowds, unfamiliar places, any unfamiliar sounds, loud sounds, changes in your routine, etc really set off a sensory meltdown. We found that using headphones to cancel some of the sound helps and you take them to school daily. You also have a whole host of chewy tubes for the oral sensory stimulation that you need. You’ve also struggled with some serious anxiety that we are watching and working on with help from your teachers and pediatrician. Despite the struggles with sensory overload, you have absolutely thrived this school year. You have met almost ALL of your original IEP goals and have gone above and beyond what we expected. We weren’t surprised, as that’s how you always do things. You go above and beyond and in your own time, surprising us in ways we didn’t know possible. One of the biggest things that you have made progress with is your speech! Language wise, you are above your developmental age. Considering that you weren’t verbal very long ago, that is just amazing! You have become much clearer in your speech, though we still see signs of the apraxia. You talk in sentences and work towards conversations with people. You are VERY polite and use your manners, which we love. You even are working at getting both feet off the ground when you JUMP! Yes, jump! How awesome is that?! Even more amazing, is that we discovered that you an incredible sight word vocabulary. We guesstimate that you somewhere over 300 sight words. We thought it was a fluke at first that you knew the words you were “reading”, but no, not at all. You love to read or be read to and you especially love to learn. Your teachers all remark at how hard you work in school and that you will work so hard to get things done, especially if you get to go “read” to other people. You have quite the little imagination. We are seeing you make strides in pretend play and wanting to involve yourself in play with other kids and adults, not just play beside them. You love to play in your McDonald’s and with your cars, and your people. You have them make conversation and chase each other and race. Every toy you play with takes on some persona. It’s absolutely fun to watch you. You were able to participate in the Collen Walker Relays and the Baytown Special Rodeo, all designed for kids that have special needs. With assistance, you were in your element, getting to do things you normally are unable to do/would not have access to. You’re favorite part was being cheered on. You love being the center of attention. You can be a bit bossy. Daddy says you get that from mommy. I say it’s just your strong will and stubborn streak. We were told at your annual ARD that you made another student in your class come back to the table to work. That you actually walked over to them, took them by the hand, and brought them back to the table and told them it was time to work!! You want to be very independent and let us know very quickly that “my do it!”. Okay, buddy. We are working with you to learn more self-help skills, like brushing your own teeth, washing in the bathtub, learning to use the potty, getting dressed and undressed, etc. Those things are still things that you struggle with, but we just know you are going to get there. You’re favorite thing to tell us now starts with, “me/my not do…” and then fill in the blank. It’s so funny to see you standing there with your little arms crossed and this serious look on your face telling us that you aren’t going to do something. Who knew that in less than a year’s time, that we would get to hear you tell us that you weren’t going to do something? Don’t get us wrong, you don’t win out, but we certainly listen to your concerns, while appreciating this little stage of development. At the same time, you are absolutely an amazingly sweet little boy. We’ve noticed how in tune you are to other people’s emotions. You get very upset if someone is upset, angry, crying, etc. You want people to be happy. We want you to know that it’s okay that someone is angry or experiencing whatever emotion they may be feeling. You aren’t responsible for their happiness, which you seem to think you are. You are super social and love talking to anyone and everyone. You are such your mama’s boy in that department! You love to hug people, even strangers! In true Cayden fashion, you express your love for the people you care about frequently. You talk of how much you love your family members, teachers, friends at school, etc. It’s so sweet to hear you express these big grown up emotions in a little guy fashion. You even talk about loving your sister and how you are going to help her with everything! Unfortunately, we had to say goodbye to your best kitty friend, Mr. Kitty, this year. It was hard to explain that to you, but you took it in stride for such a small guy. You talk about him from time to time and tell me that you see him and that you love him and he loved you. Just the other day, you came to me very sad telling me that “my best friend not here”. I asked you who that was and you told me “Daddy”. My heart melted. You love your daddy so very much and it shows. When he gets home from work you always scream out, “Daddy!” and run to him for hugs. You love to play with him and you tell me frequently that “daddy show me how”. We’ve discovered that you LOVE taking pictures and having your picture taken on our phones. I always find lots of self portraits or pictures of your toys or other people from the store on my phone. It’s cute and always a surprise. Sometimes, I even find videos. You are still very much a cuddle bug. You love to be rocked before bed and to snuggle up with mommy or daddy. Frequently, we find you in bed with us at night. I love that you still like this because it won’t be long before you tell me you are too big for that. This is the year we have struggled with illness for you. You’ve had a great run with very little illness since you came home from NICU, but this year was different. You had several upper respiratory infections/bronchitis that needed breathing treatments and some nasty ear infections. Thankfully, we were able to you better and you didn’t have to struggle too much. You were so sweet about it too, always telling the doctors “thank you for making me better” when we would leave and giving them hugs. Early in the year is when you were given “the diagnosis”. We were told you had Cerebral Palsy, affecting your legs. It was hard to hear the words, but no diagnosis or label changes who you are and that we knew. Otherwise, medically, you are doing quite well. You still struggle with reflux and weight gain. You started an appetite stimulant to help you want to eat in an effort to get you to gain weight. You are hanging out in the 24/25 pound range. You are wearing 3T clothes only for the length. You measure more size wise in the 12/18 month waist. Developmentally, you have made amazing strides cognitively and with speech, yet still struggle with your motor skills, sensory processing, and anxiety. Dr. R think that because you are still making gains with motor skills, that you’ll eventually get those skills locked down. How awesome is that?! As we begin the new year tomorrow, you’ll experience many changes. As you told me, you’ll be “four den five”. Yes, baby, but please don’t rush it! Soon, you will be a big brother and we’ll go from our family of three to a family of four. You will be going back to school and working on new goals and going into a co-teach setting. Daddy and I think that as amazing as this last year was for you, that four will be absolutely fantastic! We can’t wait to see you continue to become the little guy that you are supposed to be. Just yesterday, I told your daddy that despite all the struggles you have faced, overcome, and still are working with/through, that I wouldn’t change anything about you. I’m so thankful to be your mommy. I love you SO much little one! You bring so much joy to my world and show me how much the little things count. Christmas sure was fun this year! For the first time, Cayden wasn’t extremely overwhelmed when he walked in to see what Santa had left. He was absolutely adorable. See for yourself. His OCD tendencies were in full swing. He could NOT stop with “opening” a gift if there was even one piece of tape or paper left on it. A few times we had to step in and help him out before he had a meltdown. He loved throwing the paper and was really into opening his gifts this year. He was so cute, exclaiming, “hot wheels”, or the name of what he received. Cayden was VERY blessed this year by all of his loved ones. Santa left Sofia the First doll for him, requested of course, and he made me hold Sofia so she could “see” him opening his gifts and he would show her what he got. It was too cute for words! After we had Christmas with us, we had Christmas with my parents, brother, sister-in-law, niece and nephew. Everyone was super excited with their gifts and it was fun watching the kids get their new toys. At a few points, they got so excited that they were just wanting to rip paper off and move on versus paying attention to what they actually got. We had ham, sweet potatoes, green bean casserole, and rolls for Christmas dinner. It was yummy. Cayden crashed not too long after for a MUCH needed nap while mommy and daddy put together/opened all of his gifts so he could play with them. This was the last Christmas as a family of three. Next year, we will be celebrating as a family of four. That’s pretty wild. Here is a picture from my view of the baby mountain, otherwise known as Lorelai. P.S. There are some more pictures in the photo gallery. We didn’t get many this year in the spirit of trying to enjoy ourselves and me not being glued to the camera. Today was Cayden’s school Christmas Party. I went to be there for him. He was SO excited to see me. They had cupcakes, and cookies and juice for their party snacks. Cayden rather enjoyed his chocolate cupcake. His teacher and the paraprofessionals were so awesome to chip in and buy them stockings and actual gifts to open. The parents provided class sets of stocking stuffers. He made an absolutely adorable shirt at school for his party. I loved watching him with his friends enjoying all the fun! Click the picture to see the holiday festivities! As it turns out, Lorelai wanted to try and get here earlier than necessary too. I was feeling badly at school that morning with a lot of pain. I called in to the nurse, who was new, and told her that I had never been this pregnant and I wasn’t sure if what I was feeling was normal or if I was just a hypochondriac. Thankfully, she took me seriously, called my doctor, and they had me come in for testing. For those that don’t know, we’ve been dealing with some complications for a few months of higher levels of amniotic fluid, my sugars going nuts, and signs of placental resistance, which can cause growth restriction, etc. We’ve just been quiet about it, as not to cause concern. I got hooked up and was running a slight fever and Lorelai’s heart rate was too high. She was tachycardic. I had a great nurse that insisted that there was more going on and had me admitted. We thought that she might make her appearance that night if her heart rate didn’t come down. Thankfully, when my fever started to break, she was able to get her heart rate back in check. I got a shot of terbutaline for contractions that didn’t help, so I got magnesium sulfate. My doctor, Dr. L-R, came in and told me I gave everyone a hell of a scare, but that now that baby looked okay, we would go with the magnesium sulfate through weekend and get the steroid shots on board with monitoring. She told me that even though the monitor wasn’t necessarily picking up contractions, what I described were contractions and we needed to hold off as long as we could.